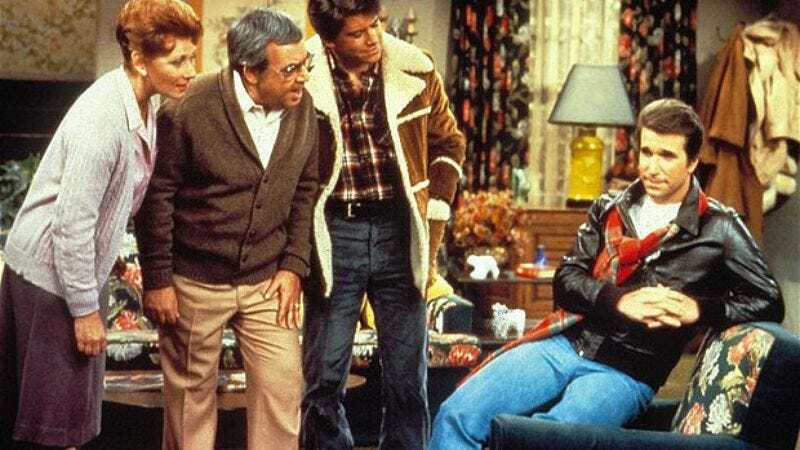 A scene from Happy Days you'll soon be able to watch without journeying back to the 1970s. In addition to hurtling you into the past by allowing you to watch episodes of old TV shows, even as you remain safely here in the present, CBS’s Decades will further bend the space-time continuum by revisiting news events that have already happened. Each day, a select few of these will be covered in a one-hour program called Decades Retrospectical—a show in which the rules of chronology become as flexible as those of spelling—that will unearth “cultural touchstones” from days of yore, such as the mid-1980s. These historical touchstones will then be reflected in a daily lineup that’s programmed around them, allowing you to experience firsthand what it must have been like for our ancestors to be dimly aware of these important cultural events while they were busy watching television. “The infamous ‘jump the shark’ episode of Happy Days, the assassination of President Kennedy, and Neil Armstrong’s walk on the moon are some of the milestones that will be highlighted and contextualized by Decades,” The Wrap says of these obscure historical events that will soon be introduced to modern viewers, and “contextualized” in between Star Trek reruns. Decades is set to launch in 2015, a far-off future that is as difficult for our 2014 brains to fathom as an old Cheers.